My first birth was great. I had the midwife-assisted-unmedicated-hospital birth I had hoped and planned for. My son was 10.6 pounds. He nursed easily. We asked to be discharged less than 24 hours after he was born and our request was honored. We felt respected and cared for. I didn't experience postpartum depression, post-traumatic-stress-disorder, or even the blues. All was well. When my son was 7-months-old I became a doula. When he was 1-year-old I went back to school, already having a master’s degree, to work towards my doctorate. I had been working in the mental health field as a therapist and was passionate about the primal period (pregnancy, birth, and the first 3-years of life). When I had to define my area of emphasis in graduate school it was clear to me that focusing in this area made the most sense. The first study I conducted was a qualitative study exploring maternal experiences with pregnancy and birth. Some of the statements really stood out to me. Many women shared a similar response when I would ask them why something occurred during their births or why they did what they did. They would say, “I don’t know, it’s just what you do.” This left me puzzled. How could so many report such a lack of information and understanding about what had happened to them, their bodies, and their babies during their pregnancy and birth experiences? So I set out to find the answer to this question: how did “just what you do” become well, just what you do. Basically, I started to explore the history of birth in our country. How did we get here? My research in this area and the implications on modern-day families became the focus of my dissertation project. It was because of my research, the science, that I decided that if I was experiencing a healthy pregnancy (meaning I was low risk) home birth was the option I would chose for any future births I would have. I was 12 weeks pregnant with my second child when I successfully defended that dissertation and earned my doctorate. About 6 months later I had another great birth experience. I had the midwife-assisted-unmedicated-home-birth I had hoped and planned for. My 2nd son was a 9.2 pounder. He nursed easily. We felt respected and cared for. I didn't experience postpartum depression, post-traumatic-stress-disorder, or even the blues. All was well. I feel it is important for me to communicate that I did not come to this movement because I was hurt. I’m not angry. I’m not seeking some redemption from a bad experience. I am here because I know the truth about how we got here. And I know what it means for moms and babies that we are here. I am here because I know that if we stay on this current course things are not going to get better, they are going to get worse, much worse. Most of all I am here because everyone deserves to have experiences like I had. No, not because I think I did it “right” or that everyone should make the same decisions I did. No, not because I think I’m better than anyone, but because EVERYONE – EVERYONE – deserves to feel respected and cared for during their births. And when I say everyone I mean the mother, the partner, the baby – everyone. The truth is my experiences are the exception not the rule and that is not okay with me. 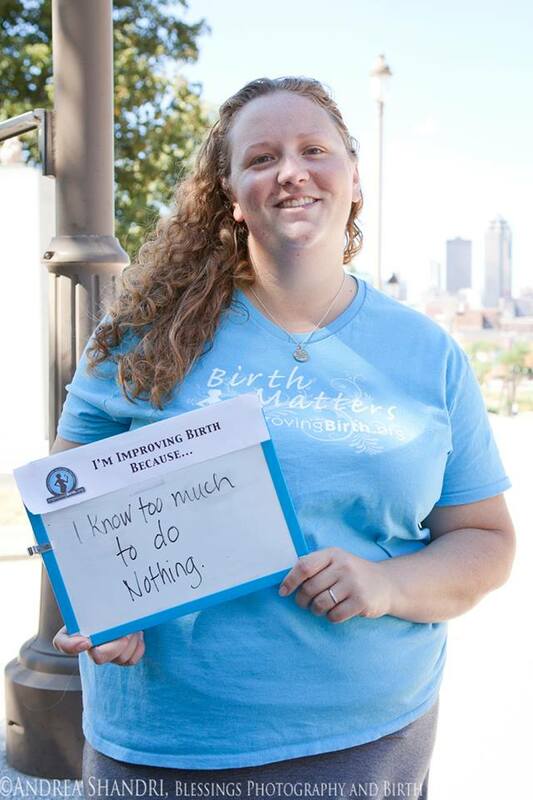 I am here, a part of this movement to improve birth, because I know that it’s not too late. I am here because I know that it wasn't long ago that we veered off course, and I believe that it’s not too late to STOP, backpedal, and get back on track. I am here because just one woman saying that she felt disrespected, silenced, or worse assaulted is one woman too many. I am here now because I know that one person can make a difference. I am here because I know that my voice matters. Most of all I am here now because I know that we can do better, but only if we demand better. I am here to demand better. I am improving birth because I know the truth and I know that we need change now.